The WWE made a trip across the Pacific Ocean over the weekend for an event featuring Brock Lesnar titled Beast in the East, and it turns out the WWE fans over there may be even more dedicated than those that are stateside. 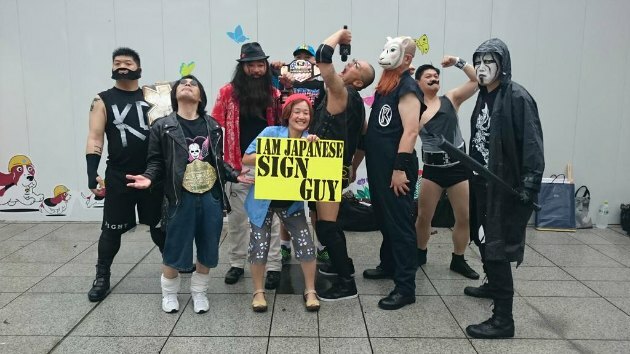 Several fans went the extra mile for their outfits for the event with some spot on costumes ranging from WWE legends to new recruits from the company's NXT promotion, and even included the infamous WWE fan known as "Sign Guy." The crew were spotted on reddit's r/SquaredCircle where they posted a group photo to show off their impressive costume work as Kevin Owens, Bret Hart, Bray Wyatt, John Cena, Sign Guy, The Rock, Erick Rowan, Simon Gotch and Sting.